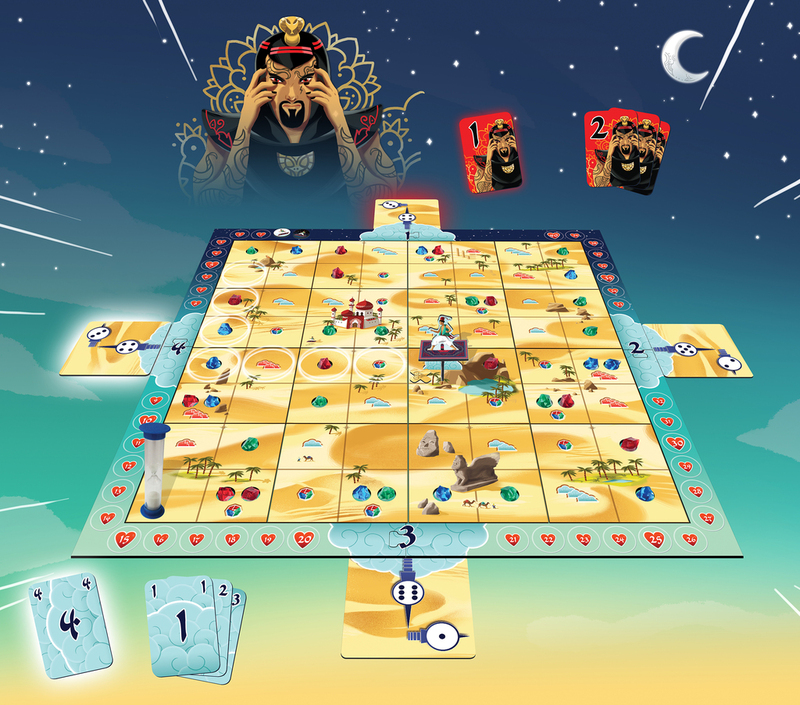 1001 is a team game where players are split into two equal (or as close to equal) team – one for day and one for night. Each team sits on one side of the table so that they can conspire more easily. The board is made up of 16 tiles which are randomly arranged in the frame. Aladdin always starts in the lower left of wherever the castle ends up on the board. There are holes in the tiles which are then randomly filled with gems. A Rewards board with 12 cards is also set up on the table. This board also has the turn track on it. Each player is given a set of vote cards (numbered 1 thru 4) and then the game begins. 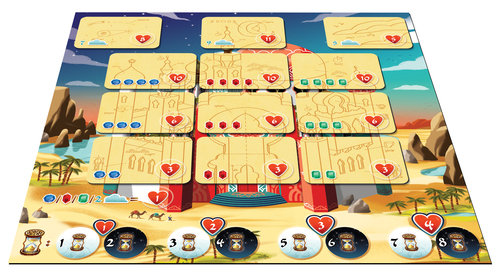 There are 8 turns in the game, and play alternates between the Day and the Night team. In the first round, the Day team is the active team. The active team first takes a cloud token from the supply. Then ,they deal out 4 flight cards and place one in each of the cardinal directions – these board locations are conveniently notated with the numbers 1 thru 4. 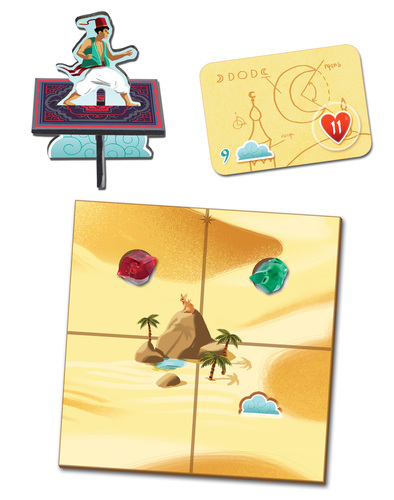 These cards each give a two step movement instruction for Aladdin. The active team may debate about which way they want to go. At any point in the debate, players on this team can choose one of their 4 vote cards and place it facedown on the table. They may talk out loud – but beware that the opponents can hear what you’re talking about! The team might even decide to vote unanimously – however, in the end, each player is able to decide for himself which vote card he will put on the table. At the same time, the opposing team is doing two things. First, as a team, they secretly choose one of the four directions to ban from the active team. They select the red Vizier card with the same number and place it facedown on the table. At the same time, each Opposing player chooses one of their own Vote cards – they are trying to choose a number which matches at least one of the votes made by the Active team. Now it’s time to score the round. All Vote and Vizier cards are now revealed. Then, each Opposing player sees if there is at least one matching vote from the Active side. If so, that Opposing player collects individual VPs equal to the scale shown on the turn track. If Aladdin flies, he simply follows the two directions on the chosen movement card. As he flies over tiles, he may gain or lose gems and clouds. If his team were ever to run out of cloud tokens, his movement immediately stops. Both teams should remember that they are limited to 5 gems and 10 cloud tokens at any time. Once the flight is over, then it is time for the active team to buy rewards. The team can buy up to one Reward card from the Rewards board. They simply pay the price on the bottom of the card and then score the points printed on the card – for instance, one is 7 cloud tokens for 8 VP. The card is removed from the board so that it cannot be purchased again this turn. Additionally, 2 clouds or any 1 gem can be converted to a VP at any time. The team is free to decide to keep any clouds and gems for the next turn – however, the hard limits of 5 gems and 10 clouds is always in effect. Then, play switches, and each team takes on the opposite role. This goes on for a total of 8 turns. At the end of the 8th turn, players figure out their final score – this is their team VP added together with then individual VPs from predicting the voting. There is no tiebreaker. 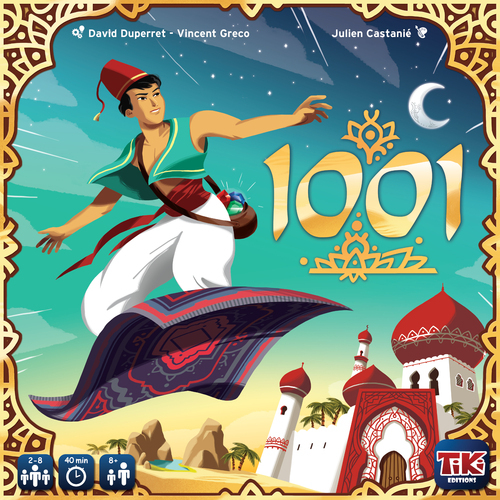 1001 is a game with a little bit of negotiation, a little bit of bluffing and a whole bunch of “Read my mind”. In general, all four of the paths created by the cards should have some sort of positive and negative for the Active team. It is sometimes quite hard to determine if there is an optimal choice or not – especially early in the game when the Reward board is still quite full and there are very many different combinations of things which will lead to a high scoring Reward card. There is a nice risk/reward calculation in deciding whether or not to vote unanimously. The three point bonus can be a decent scoring bump (especially when winning scores can be in the 30s) – but you do run the risk of losing an entire turn – out of ONLY four! – if the Vizier blocks your solitary choice. The limited number of round makes each one important, and does try to force you into choosing flying routes that lead you to getting a Rewards card. These cards are the most efficient way to score VPs, and ideally, you’d like to be able to get four cards total in the game. However, as I mentioned earlier, it does get a bit harder to disguise your intent near the end of the game because there are simply fewer choices that would lead to a Rewards card. Like many games with dueling negotiations, a big issue is figuring out how to communicate with your team while not allowing the other side to hear what you’re trying to do. Sure, you could try to “bluff” by talking out loud about plans that you don’t plan to do – but you only have 2 minutes to make a plan, and anyways, you might end up bluffing out your own teammates! There is also a bit of negotiation that may have to take place in the rewards buying phase as the team has to come to a consensus as to their plan – though at this point, nothing needs to be kept secret because there’s nothing that the other team can do to stop you. Our games have come in around 20-25 minutes, and to be honest with you, that’s enough of this at one time for me – it does not overstay it’s welcome due to its brevity. We have yet to see an individual victory come from a team which did not win the team battle – as you can only score a maximum of 10 individual points, and it generally turns out that most people are scoring between 6 and 10. Like most negotiation games, this one is take it or leave it for me. At least this one has the strong advantage of being blissfully short. The 2p game is actually much better for me – as it takes out the whole negotiation thing. The active team gets two sets of vote cards and can choose to either vote unanimously or give two different votes. This then becomes a more cerebral, 1v1 read-my-mind game, and that was far more enjoyable for me than the team version.